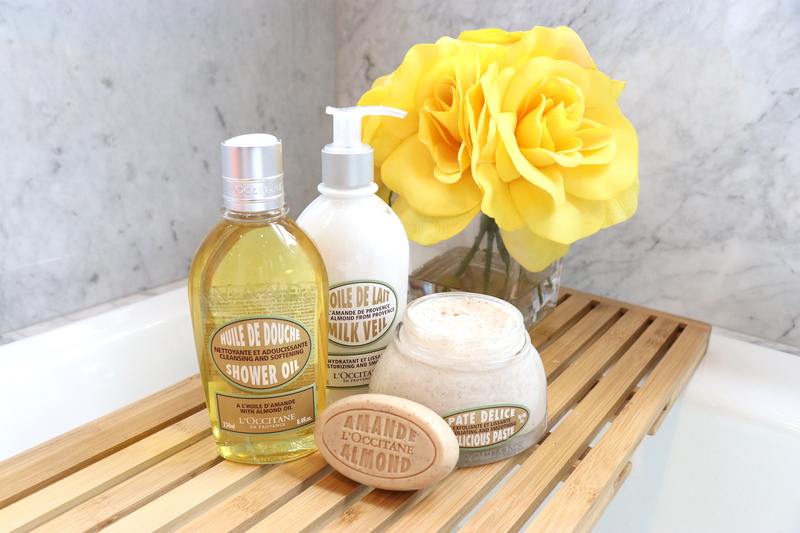 So a few weeks ago during the Sephora sale, I picked up the L’occitane Cleansing And Softening Shower Almond Oil on the recommendation of Courtney Shields, who by the way, is possible the cutest person ever! Anyway, my skin had been so insanely dry, I’m taking like…so dry I basically just needed a whole new set of skin, kinda dry. Long behold after a few showers with this magical little concoction, my skin is smooth, supple and smells simply divine. It is an oil foaming formula that when mixed with water turns into an almost milky like lather that glides onto the skin. I honestly never knew a body wash could have such an amazing effect on my skin, it practically eliminated the need for lotion all together! I just found out they actually make a giant pump bottle of it, so safe to say…that will be arriving in my mailbox soon. Now just when I thought things couldn’t get any better, enter Almond Supple Skin Oil. Basically the “leave in conditioner” of body care. Its essentially a leave on and rub in version of the shower oil that provides an added layer of hydration that lasts up to 48 hours. In addition to smoothing the skin, its ingredients also help to make skin feel firmer. I may only be 29, but I need all the preventative aging measures I can get! If the name alone doesn’t intrigue you, the sensation sure will. The Moisturizing and Smoothing Milk Veil is a fast absorbing body lotion that not only feels like liquid angels on your skin, but leaves a beautiful light shimmer. It contains good for your skin ingredients such as almond oil, milk and proteins that also smell absolutely divine. This also comes in a thicker formula known as the Almond Milk Concentrate. Its rich texture is something I like to spoil myself with during an at home spa day or when I am fresh out of the bath. It’s no secret I love a good exfoliator so when I found out L’occitane made an Almond Delicious Paste I was beyond exciting. An amazing blend of almond butter (not the sandwich kind) and almond oil to moisturize the skin paired with crushed almond shells and sugar crystals for the perfect amount of skin softening exfoliation. Not only does it make my skin softer than a babies bottom but it smells good enough to eat!